Teach Your Children HOW to Think, Not WHAT to Think! Are you dreaming of respectful, responsible kids who make healthy, wise choices? Do you want your children to be independent leaders who can think for themselves and stand up to peer pressure? Of course you do! But how do you encourage these important life skills without inviting rebellion and disrespect into your own homes? Bribes, lectures, threats, yelling, anger, nagging and punishment can backfire and wear you out. Put the fun back into parenting with classes and parent coaching with Lisa! Lisa is an author of several Love and Logic® resources, a certified family life educator, certified parent coach and (most importantly) MOM! Lisa presents workshops to hospitals and non-profit organizations around the country. Parents will walk away with a lighter step and simple, practical parenting tools. Lisa's message is: "You can do it!" Click here for upcoming classes and workshops. These resources show parents and professionals how to apply Love and Logic concepts to raising children with chronic illness, medical conditions, and other special needs. 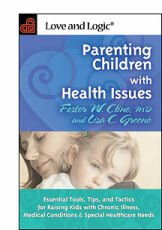 For information including free articles, audio, and video visit: www.ParentingChildrenWithHealthIssues.com. Since 1977, Love and Logic has been teaching parents and educators worldwide how to raise respectful, responsible, happy kids. That's over thirty years of working successfully with families. Each year, hundreds of thousands of parents, educators, and other professionals learn Love and Logic through workshops, classes, and other Love and Logic resources. Love and Logic is so effective because it's simple, practical, easy-to-learn and works immediately. From toddlers to teens, you'll discover how to raise responsible kids and have more fun parenting! Lisa facilitates Love and Logic's popular parenting programs Becoming a Love and Logic Parent, Early Childhood Parenting Made Fun, Parenting the Love and Loigc Way, and 9 Essential Skills for the Love and Logic Classroom.